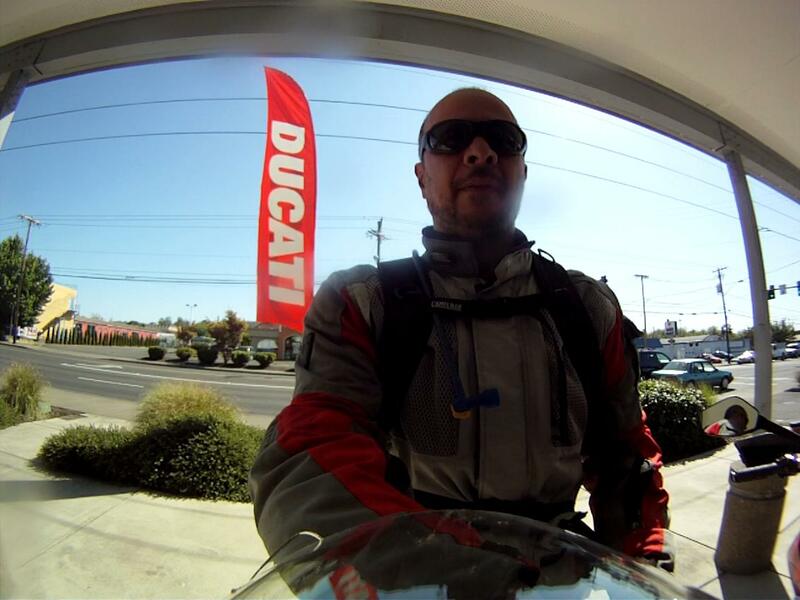 Last year I test rode the 2010 Ducati Multistrada 1200 just after it had first arrived in this parts of the world. 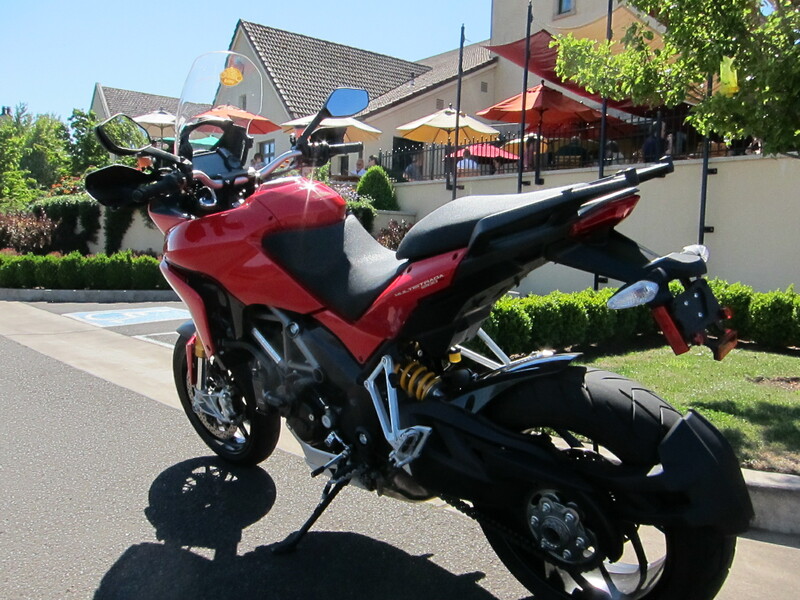 The European Motorcycles of Western Oregon offered me another chance to ride the beautiful and powerful Multistrada earlier this month. This bike is a dream ride, I could not and would not pass on another opportunity to ride it. Therefore, here I am, reporting to you this awesome experience with comments, photos and videos. When they hand you the keys, you should know, there isn’t a slot for the ignition key on this bike. And the keys do not look like a regular key. Press that silver button, and now it looks like a real key. 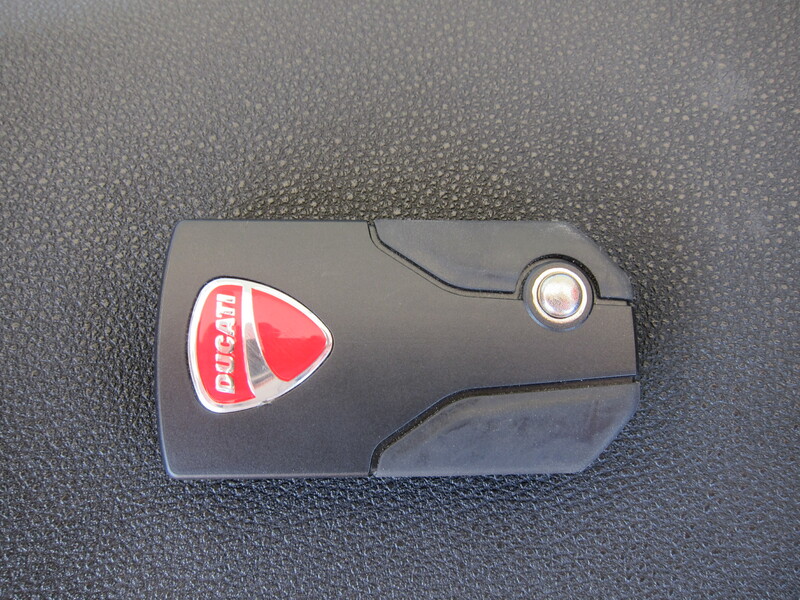 However, you only need the key in its traditional form to open the gas tank, remove the seat, or lock/unlock the panniers, if your bike comes with the Ducati luggage system. 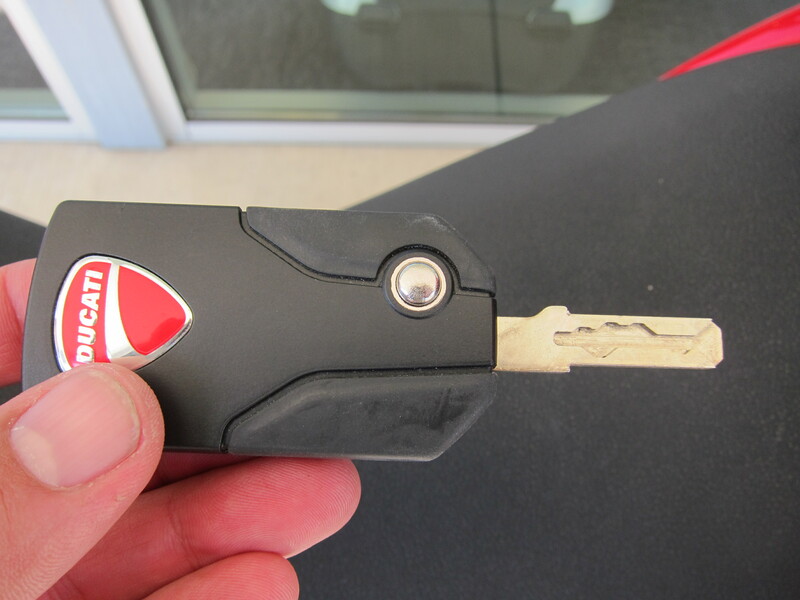 Otherwise, you can carry the key in your pocket or anywhere on the bike. It just needs to be close enough to the bike to transmit the authorization that allows the bike to power up. 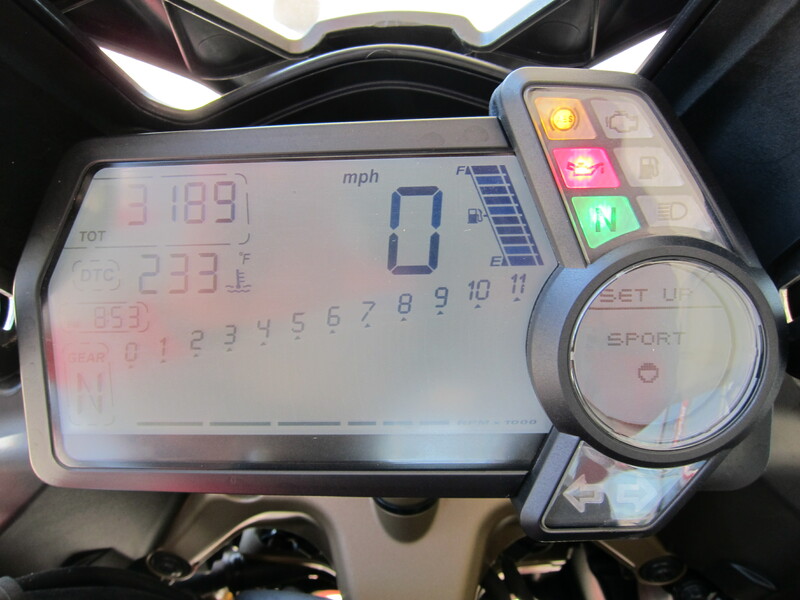 With the key safely stored in your pocked or in the glove box (there is a convenient compartment to the right of the instrument cluster), you only need to press the black button in the top of the tank fairing and the bike will power up. Then the bike’s motor is ready to be started on the traditional way by pressing the handle bar ignition button. But before starting it, let’s select a riding mode. As I explained on the other review of this bike, it has four pre-set riding modes. Urban, Enduro, Touring and Sport. The first two limit power output to an estimated 100hp. Touring and Sport let all the horses out to the proclaimed 150hp figure. These settings are based on pre-set levels for acceleration, suspension, traction control and ABS engagement. You can also add more color to the settings by setting other parameters such as the bike’s load (passenger, no passenger, and different level of load). And you can finetune the pre-sets with your desired levels of traction control or ABS engagement. It is a very sophisticated machine. For this test test ride, I was simply glad to use the default pre-set values. I put the bike on sport mode. 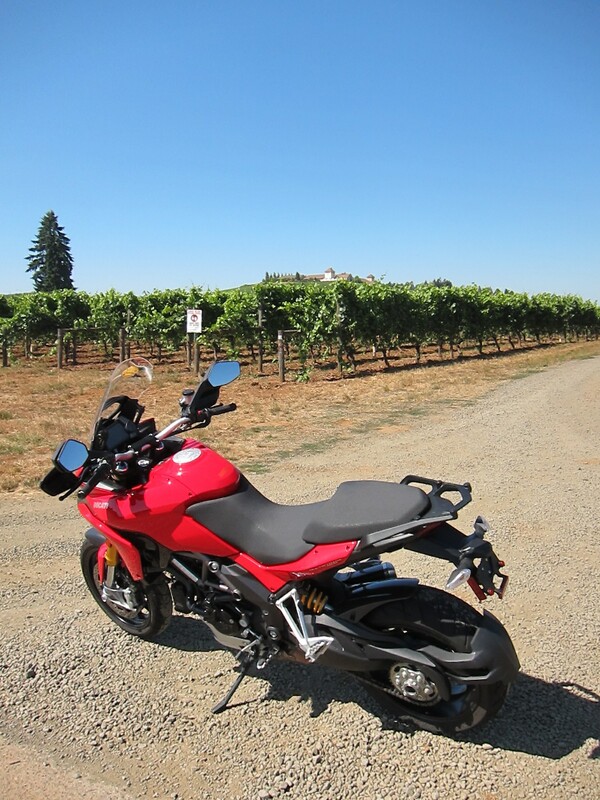 I would have the bike for a couple of hours, so I took it to my usual testing grounds towards the King Estate winery. Before getting on the specs and riding characteristics, let’s talk about the looks of this bike. 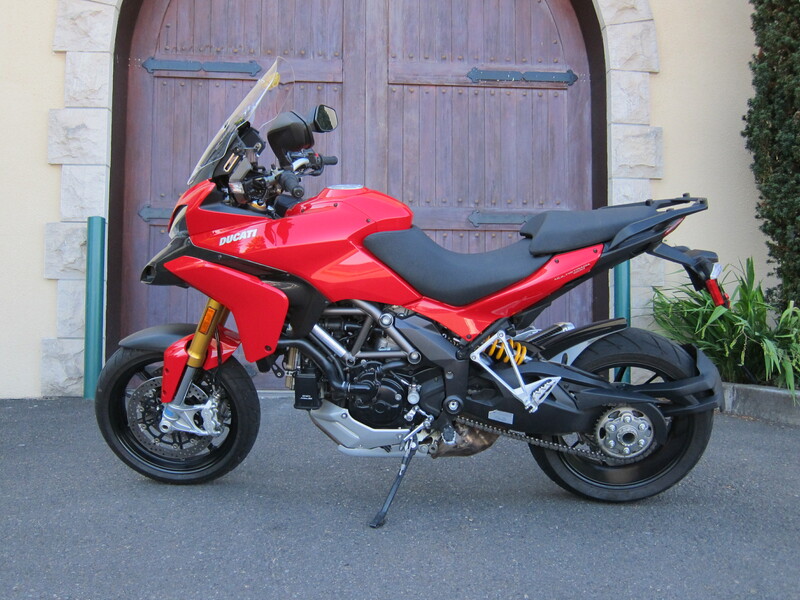 The Multistrada line has had a somewhat controversial set of opinions. The old and the new model alike, but for different reasons. On this bike, the most talked about item is the beak which is also the air scoop. I actually like it. Specially in carbon fiber finish, how is the case for the test bike. A small detail that makes a difference! To repeat my own words when I reviewed the Ducati Monster, in the end, the Italian designers are proven right. That is, sometimes their designs are controversial, but the more you look at their bikes, the more you get it. Once you see the bike in person, you will visualize high performance, speed, agility, lightness, fun. All of that without turning the ignition on, without hearing the motor, without riding it. It is just what the design evokes. And once you ride it, you will confirm all of those attributes. If performance is something that you want, this bike won’t disappoint you. While pushing the bike on the lot or garage and getting it ready for a ride, you will confirm how light it feels. Mounting the bike, the first impression you get is of comfort. And again it feels light as you shift support from right feet to left feet. Great size as well, for an adventure tourer, it is compact compared to the other 1200cc adventure bikes. I’m 5ft 11″, which is pretty much average size, and this bike fits me like a glove. All commands are in reach and the instrument panel is nicely set forward from you and sits tall, making it easy to keep an eye on the information without moving your eye sight too far from the action ahead. It has a very informative panel. The information is managed by buttons in the handle bar, left side. 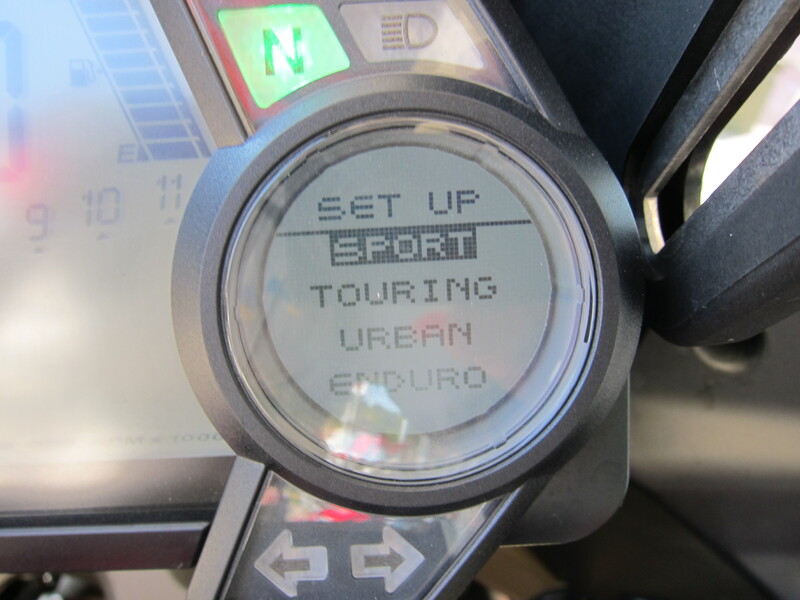 You can even change riding mode on the fly, by pressing the clutch all the way while pressing one button. By the way, on the above set up I have the bike on “sport” mode with “no passenger, no bags” (that is the one helmet icon below “sport”). The only negative comment I will make on this bike’s design is regarding the dashboard. Although it is great for being efficient for packing a lot of information on a compact package, in my opinion nothing substitutes an analog tachometer. When you start that motor, you will know, it tells you, the adventure is about to start. Here is a video of me starting the bike, then I change it from “Urban” to “Sport” mode, walk around it and start riding. You will notice the Termignoni exhaust. It provides a great tune to the already great sounds of this machine. But I’m ambivalent about the looks. If power is not changed by a slip on, I would keep the original exhaust for its double tip design. It is not like you need more power and better sounds from this machine in its original configuration. Riding it. Like all Ducatis I’ve ridden so far, all with variations of the Type L motor, acceleration can be summarized in several degrees of effortless. These motors are “torquey” and give you that feeling of enjoying speed. 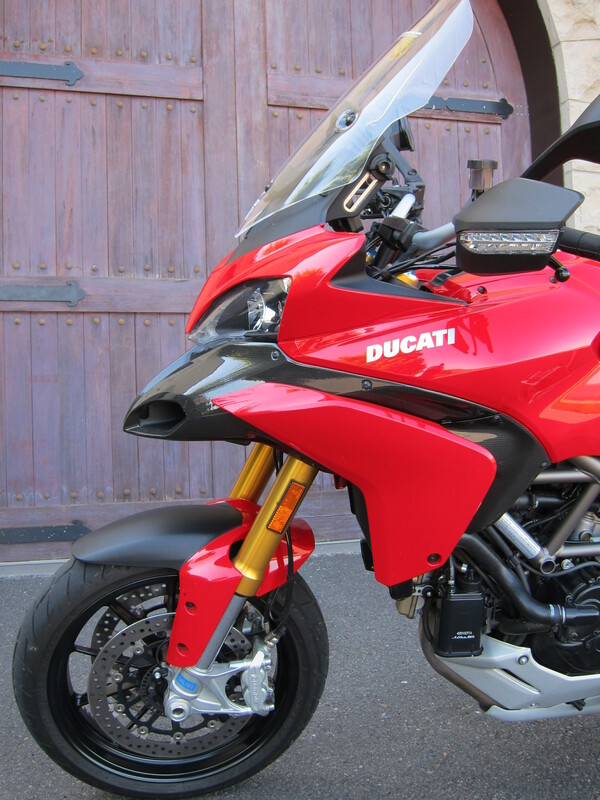 Compared to other bikes on this Enduro or Adventure Tourer segment, the Ducati feels lighter. Not only on acceleration but overall, but “lighter” gives a feeling of attainability on varied riding conditions. With the Ohlins fully adjustable suspension, and the pre-set modes, you always get the best of what the bike can offer. It is hard for the regular rider to set up a suspension. On this bike, you don’t need to be a genius, you just need to press a button and let itself setup for your riding situation, including the weight you carry with you. 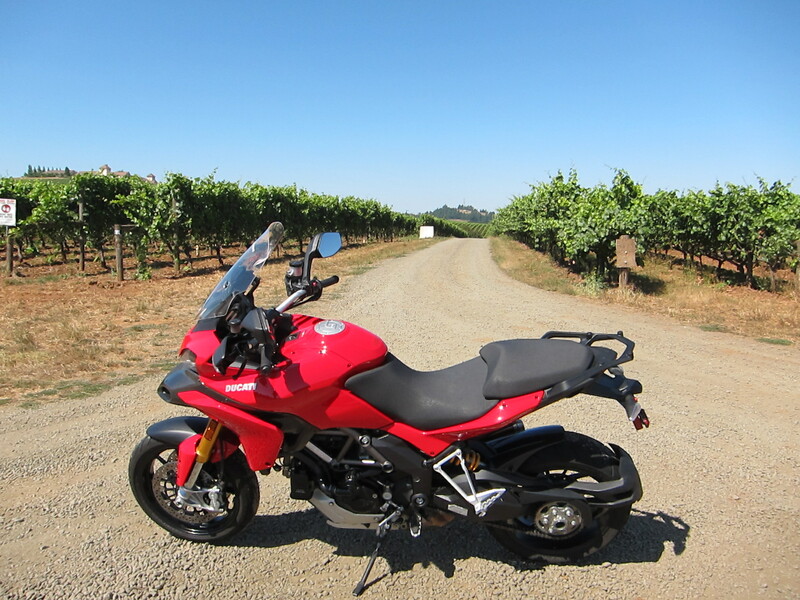 Not worrying about the suspension, and having a solid chassis, all you need to do is point the bike to where you want to go, give the appropriate counter steering, twist the throttle to reach your leaning comfort level, and you are rewarded by the Ducati experience disguised as an Adventure Touring machine. Although this machine is sure to satisfy expert riders, I assure, you don’t need to ride fast to enjoy this machine. Hearing that motor rev in the mid range, curve after curve as you moderately roll on the throttle by the apex will provide the average rider, a guy like me, plenty of riding satisfaction. But be warned, if you are not careful, it will go fast and you may not notice you are moving fast. Tickets are expensive, so be mindful of the power this bike can deliver. Remember it has a super bike motor in there! Although they are smooth motors, Ducatis in general are not your grocery gather, well, for bikes we may say they are not your best mode of transportation for the trip to the Starbucks. They will do that very well, mind you, and they will look good in front of the store as well. But I don’t see these machines doing their best in stop-n-go traffic. They excel on the open road. So if you get one, remember to take it out on the open roads to stretch its muscles and have some fun. And from my riding time with it, although limited in duration, I felt assured the Multistrada is a great touring machine as well. I mentioned earlier that I would point to only one fault on the design of this machine, which was the absence of an analog RPM gauge. But I hear comments on forums where people question its real capacity as an Enduro machine. Some of the comments are about its price and the cost of repairs when putting the bike in the off pavement situations that have a higher risk for dropping it. I believe it is fair to think about expensive body repair costs. Thinking about that can ruin the riding experience. But one can find ways to protect the bike with appropriate crash bars. The comments people make about the fact the rear wheel size and its consequent limitation of tire choice (see this bike’s specs at the end of this report) seem to be most limiting to some riders. You will not find an aggressive dual purpose tire, let alone a real knobby tire, that will fit that wide rear wheel size of this bike. But you will find something that will provide reasonable adherence on dirt without too much compromises on pavement. 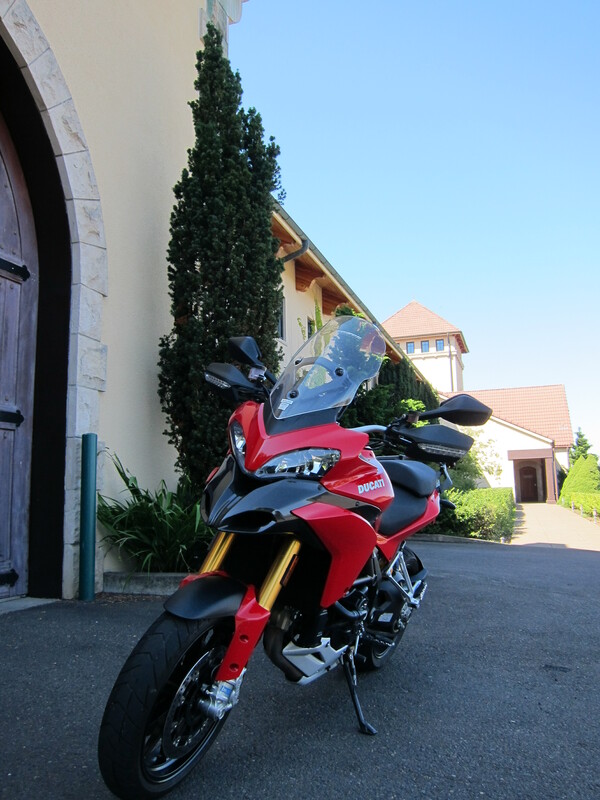 I did not ride the Multistrada on a dirt road. Only posed on it for a photo. However, with the risk of sounding like I am bragging about my riding ability, which I am not, I’ve ridden bikes with street tires on dirt and gravel roads. To be honest with you, I don’t know how much street tires are a real limiting factor, or by how much it will limit performance on dirt and gravel. This bike has the suspension for the “dirty” job, it offers levels of traction control, and levels of ABS control. Unless you are planning on taking it on a mud excursion you should be fine. If you can handle the other 1200 cc Enduro machines (the R1200GS, the SuperTenere 1200, or the Moto Guzzi Stelvio) on dirt and gravel roads, you will be able to do the same with the Multistrada on even if all you can get in terms of tire choice are some mild dual purpose tires. It has the suspension, it feels light (it is lighter!) than these other three machines, and it has the electronic riding aids to assist you in the job. Granted, I haven’t ridden it on dirt. So this is my speculation. To corroborate with my opinion, though, let’s have the pros show what this machine can do on dirt roads. This is a video of Greg Tracy’s practice run on Pikes Peak in 2010, with a Ducati Multistrada not unlike the one I tested here. At some point of this video you will see him ride on dirt at speed. The machine does it really well! The tires he used are different than the stock Pirelli tires. But they are not knobby tires. At best, I would classify them as mild dual purpose tires, a good compromise for the 60% pavement / 40% dirt of the Pikes Peak climb. This bike is basically what you get from a dealer’s floor. No knobby tires. It is about “when” not “if”. And an Italian machine would go well with my Italian passport. Now it is your turn. 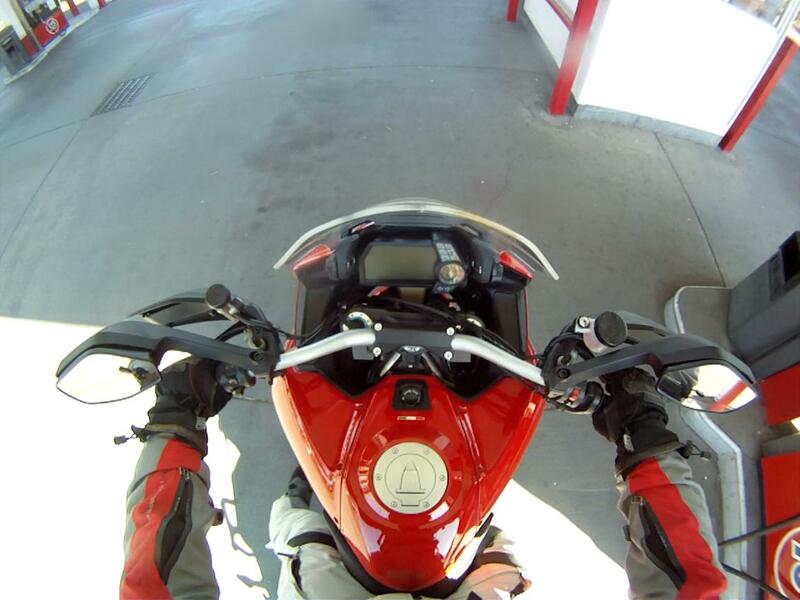 Take one for a test ride at your local Ducati dealer. 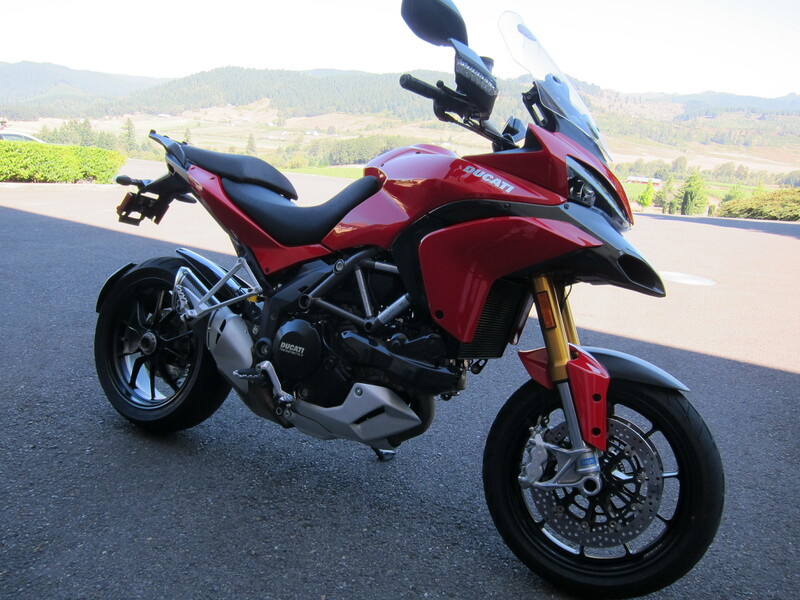 This entry was posted in Bike Reviews and tagged Ducati, motorcycles, Multistrada, oregon. Bookmark the permalink.